Elih Villanueva was born on Sunday, July 27, 1986, in Miami, Florida. 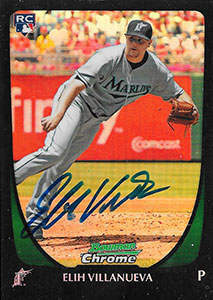 Villanueva was 24 years old when he broke into the big leagues on June 15, 2011, with the Florida Marlins. His biographical data, year-by-year hitting stats, fielding stats, pitching stats (where applicable), career totals, uniform numbers, salary data and miscellaneous items-of-interest are presented by Baseball Almanac on this comprehensive Elih Villanueva baseball stats page. Miami Dade College & F.I.U. & F.S.U. Did you know that Elih Villanueva appeared in exactly one Major League game and is featured on our Cups of Coffee page? Every ballplayer with a single cup of coffee is included and sortable columns make researching them as enjoyable as a real cup of coffee!